I was looking at a certain area in North East part of India ( State called "Arunachal Pradesh") which is integral part of India. Both URL's have different take. [Google Maps] shows it as Disputed Territory ( with Dash lines) and [Google Ditu] shows it altogether as part of China! So, that got me unruffled and to question validity of both these sources. How does Ditu differ from Google maps? Whats association between the two and does Ditu has autonomy to change the boundary of the maps as per its wish. Arunachal Pradesh is a border region between China and India - with 70% of the land being claimed by the Chinese as South Tibet. The border in question was decided in 1914 and called the McMahon Line, but never agreed upon by the Chinese. The Google Ditu vs. Google Map views. Territorial disputes are definitely not a new thing - however what is perhaps alarming is that there are two different representations of reality from the same vendor and data providers. So this is entirely a representational decision that is most likely driven by business and government pressures. What's particularly interesting here is that primarily these definitions of boundaries derive from the data providers. You can look in the bottom right corner for who the data providers are. For both versions the providers are the same: TerraMetrics, Mapabc, and Europa Technologies. So it seems that the cartographic designers at Google Ditu have decided to represent it a certain way. Unfortunately, the map has no additional metadata. As broad consumption of maps increases, there is a commensurate interest in the why and what behind them. Who said these are the boundaries, when were they set, and why are they shown in this language? And I don't mean the long reams of unreadable metadata that are the current standards in the geospatial community, I mean human understandable descriptions of the various aspects of the data, while allowing additional discovery to deeper data. One place that you can look at the data behind the source of the map is in OpenStreetMap. 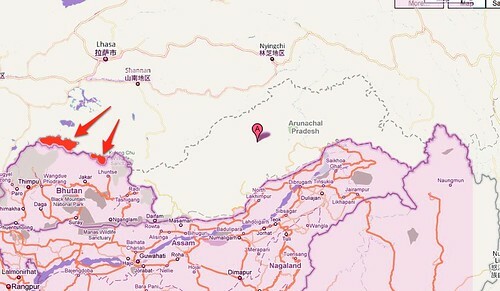 Arunachal Pradesh is shown similar to Google Maps version, and a user could optionally download the data to see the attributes, edit history and sources. Alternatively I can look in GeoCommons for the GADM Admin boundaries of India and see pertinent data on who provided the data, sources, and so on. The representation of boundaries is obviously a very contentious issue in mapping. Maps are perceived, and often do inform, territory. There is a long history of map representation being used to influence, coerce, and force land rights. Unfortunately, even in a "Web2.0" world of bi-directional sharing and collaboration, with maps we're still often forced to accept a particular viewpoint. They have on-the-ground meaning and political impact. A well known example of this were the first "edit wars" in OpenStreetMap with the names of places in Cyprus. The resolution was to by default abide by the on the ground signage, but also store both versions and allow users to provide their own personalized perspective. There isn't an easy answer here - with companies such as Google there are obviously market, and government, forces that direct how to represent contentious issues. The best solution is to offer background, open data, and alternative perspectives. Without a voice, citizens are relegated to discussions by officials they may, or may not, have elected - and no meaningful way to illustrate their interpretation.